Anthony Charles Zinni (born September 17, 1943) is a former United States Marine Corps general and a former Commander in Chief of the United States Central Command (CENTCOM). In 2002, he was selected to be a special envoy for the United States to Israel and the Palestinian Authority. While serving as special envoy, Zinni was also an instructor in the Department of International Studies at the Virginia Military Institute. Currently[timeframe? ], he is an instructor at the Sanford School of Public Policy at Duke University, a public speaker, and an author of best-selling books on his military career and foreign affairs, including Battle for Peace. As of 2005[update], he was involved in the corporate world, joining M.I.C. Industries as its president for International Operations in 2005. Zinni also serves or has served on the advisory boards of a number of companies, including the security testing firm, Mu Dynamics, based in Sunnyvale, California. He joined Duke University's Terry Sanford Institute of Public Policy in Spring 2008 as the Sanford Distinguished Lecturer in Residence and taught a new course in the Hart Leadership Program. He has been credited for foresight in predicting the dangers of terrorism coming out of Afghanistan before the September 11 attacks of 2001 and supporting the Iraq War troop surge of 2007. In October 2009 he came out firmly in support of General Stanley A. McChrystal's request for up to 40,000 additional troops in Afghanistan. Zinni was born in Conshohocken, Pennsylvania, the son of Lilla (Disabatino), a seamstress and homemaker, and Antonio Zinni, a chauffeur. His parents were of Italian descent. In 1965, Zinni graduated from Villanova University with a degree in economics, and was commissioned a second lieutenant in the United States Marine Corps. After completion of the Basic School, he was assigned to the 2nd Marine Division, where he served as a platoon commander, company executive officer, and company commander in the 1st Battalion, 6th Marines. He also served as a company commander in the 1st Infantry Training Regiment during this tour. In 1967, Zinni was assigned as an infantry battalion advisor to the Vietnamese Marine Corps. Following the Vietnam War, he was ordered to the Basic School where he served as a tactics instructor, platoon commander, and company executive officer. In 1970, he returned to Vietnam as a company commander in 1st Battalion, 5th Marines where he was wounded, evacuated, and subsequently assigned to the 3rd Force Service Support Group on Okinawa. There he served as a company commander and guard officer. In 1971, Zinni returned to the 2nd Marine Division, where he served as a company commander in the 1st Battalion, 8th Marines, Aide de Camp to the Commanding General, and Officer in Charge of the Infantry Training Center. In 1974, he was assigned to Headquarters Marine Corps, where he was assigned as the Retention and Release Officer and Plans Officer in the Officer Assignment Branch of the Manpower Department. Zinni again served in the 2nd Marine Division in 1978, as the Operations Officer of the 3rd Battalion, 2nd Marines, Executive Officer of the 1st Battalion, 8th Marines, Executive Officer of the 8th Marine Regiment and Commanding Officer of the 2nd Battalion, 8th Marines. In 1981, he was assigned as an operations and tactics instructor at the Marine Corps Command and Staff College at Quantico, Virginia. He was next assigned to the Operations Division at Headquarters, U.S. Marine Corps where he served as the Head of the Special Operations and Terrorism Counteraction Section and as the Head, Marine Air-Ground Task Force Concepts and Capabilities Branch. In 1984, he earned his master's degree from Central Michigan University. In 1986, he was selected as a fellow on the Chief of Naval Operations Strategic Studies Group. From 1987 to 1989, Zinni served on Okinawa as the regimental commander of the 9th Marine Regiment and the Commanding Officer of the 35th Marine Expeditionary Unit, which was twice deployed to the Philippines to conduct emergency security operations and disaster relief operations. Upon his return to the U.S., he was assigned as the Chief of Staff of the Marine Air-Ground Training and Education Center at Marine Corps Base Quantico. His initial general officer assignment was as the Deputy Director of Operations at the U.S. European Command. In 1991, he served as the Chief of Staff and Deputy Commanding General of Combined Task Force Operation Provide Comfort during the Kurdish relief effort in Turkey and Iraq. He also served as the Military Coordinator for Operation Provide Hope, the relief effort for the former Soviet Union. In 1992–93, he served as the Director for Operations for the Unified Task Force in Somalia for Operation Restore Hope. Also in 1993, he served as the Assistant to the U.S. Special Envoy to Somalia during Operation Continued Hope. Zinni was assigned as the Deputy Commanding General, U.S. Marine Corps Combat Development Command, Quantico, Virginia, from 1992 to 1994. From 1994 to 1996, he served as the Commanding General, 1st Marine Expeditionary Force. 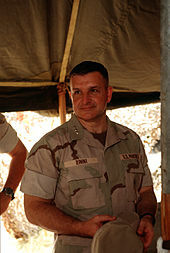 During early 1995, Zinni served as Commander of the Combined Task Force for Operation United Shield, protecting the withdrawal of U.N. forces from Somalia. Zinni briefs reporters as to the results of Operation Desert Fox in December 1998. From September 1996 until August 1997, Zinni served as the Deputy Commander in Chief, United States Central Command. His final tour was from August 1997 to September 2000 as the Commander in Chief, United States Central Command, MacDill Air Force Base, Florida. He organized Operation Desert Fox, a series of airstrikes against Iraq during December 1998, with the stated purpose of degrading Iraq's weapons of mass destruction program. As CinCCENT, he participated with General Wesley Clark, CINCEUR, in a mini-summit between each other to determine policies over Africa. Clark was reluctant to support Zinni's activist attempts to engage more in Africa. Following his command of CENTCOM, he retired in autumn 2000. Zinni has attended the John F. Kennedy Special Warfare Center and School, Amphibious Warfare School, Marine Corps Command and Staff College, and the National War College. He holds a bachelor's degree in economics and two Master of Arts degrees, one in international relations from Salve Regina University and another in management and supervision. His son, Anthony Zinni, serves in the Marine Corps, and was promoted to the rank of major effective September 1, 2010. Iraq remains the most significant near-term threat to U.S. interests in the Persian Gulf region. This is primarily due to its large conventional military force, pursuit of WMD, oppressive treatment of Iraqi citizens, refusal to comply with United Nations Security Council resolutions (UNSCR), persistent threats to enforcement of the no-fly zones (NFZ), and continued efforts to violate UN Security Council sanctions through oil smuggling. While Iraq's WMD capabilities were degraded under UN supervision and set back by Coalition strikes, some capabilities remain and others could quickly be regenerated. Despite claims that WMD efforts have ceased, Iraq probably is continuing clandestine nuclear research, retains stocks of chemical and biological munitions, and is concealing extended-range SCUD missiles, possibly equipped with CBW payloads. Even if Baghdad reversed its course and surrendered all WMD capabilities, it retains the scientific, technical, and industrial infrastructure to replace agents and munitions within weeks or months. A special concern is the absence of a UN inspection and monitoring presence, which until December 1998 had been paramount to preventing large-scale resumption of prohibited weapons programs. A new disarmament regime must be reintroduced into Iraq as soon as possible and allowed to carry out the mandates dictated by the post-Gulf War UN resolutions. Extremists like Osama bin Laden and his World Islamic Front network benefit from the global nature of communications that permits recruitment, fund raising, and direct connections to sub-elements worldwide ... Terrorists are seeking more lethal weaponry to include: chemical, biological, radiological, and even nuclear components with which to perpetrate more sensational attacks ... Three [Iraq, Iran, & Sudan ] of the seven recognized state-sponsors of terrorism are within this potentially volatile area, and the Taliban regime in Afghanistan has been sanctioned by the UN Security Council for its harboring of Osama bin Laden. Nearly one half of the 28 recognized terrorist organizations have operational sites within the region. Afghanistan has emerged as a catalyst for regional instability offering sanctuary, support, and training facilities to a growing number of extremist elements. In August 2017, Zinni traveled to the Persian Gulf at the request by United States Secretary of State Rex Tillerson to help mediate the 2017–18 Qatar diplomatic crisis. Zinni orating in January 2009. Zinni holds positions on several boards of directors of major U.S. corporations. In addition, he has held academic positions that include the Stanley Chair in Ethics at the Virginia Military Institute, the Nimitz Chair at the University of California, Berkeley, the Hofheimer Chair at the Joint Forces Staff College, and the Harriman Professorship of Government and membership on the board of the Reves Center for International Studies at the College of William and Mary. He has worked as Chairman of the Board of the Middle East Institute, with the University of California's Institute on Global Conflict and Cooperation and the Henry Dunant Centre for humanitarian dialogue in Geneva. He is also a Distinguished Advisor at the Center for Strategic and International Studies and a member of the Council on Foreign Relations. He was the Executive Vice President for Dyncorp International from July 18, 2007 to the end of 2008. He served on the Board of Directors of Dyncorp International prior to that position. He serves or has served on the Board of Trustees of the National Constitution Center in Philadelphia, which is a museum dedicated to the U.S. Constitution. As of 2014[update], he serves as Chairman of the Board of Governors of the Middle East Institute. He has been named Honorary Chairman of that institution. Zinni also serves as an Honorary Board Member of the non-profit Wine Country Marines – a 501(c)3 dedicated to helping wounded service members, and aiding the welfare of currently serving service members, as well as addressing veterans employment and transition and healthcare. In April 2004, Zinni gave a lecture entitled "From the Battlefield to the Negotiating Table: Preventing Deadly Conflict" at the University of San Diego's Joan B. Kroc Institute for Peace & Justice Distinguished Lecture Series. 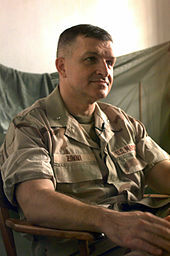 In 2004, Zinni was named in an investigative report by Diana B. Henriques of The New York Times as being among the "retired or former military people" recruited to the corporate boards and sales forces of investment firms engaged in deceptive marketing of financial instruments aimed at military veterans in order to lend them credibility. The investment firm that had recruited Zinni, First Command Financial Planning, Inc., responded in written comments to a subsequent United States House of Representatives investigation that "It would be unfortunate if anyone inferred that these honorable individuals would take any action or support any organization that did not act in the best interests of service members." The U.S. Securities and Exchange Commission (SEC) and National Association of Securities Dealers (NASD) subsequently concluded that First Command "willfully violated the Securities Act of 1933 Section 17(a)(2) dealing with inter-state fraud." In particular, the SEC concluded that First Command had sold mutual fund investments to veterans termed "systematic plans" which had very high sales charges termed "front-end sales loads", "by, in part, making misleading statements and omissions concerning, among other things: (a) comparisons between the systematic plan and other mutual fund investments; (b) the availability of the Thrift Savings Plan ("TSP"), which offers military investors many of the features of a systematic plan at lower costs; and (c) the efficacy of the front-end sales load in ensuring that investors remain committed to the systematic plan." In December 2004, First Command entered into a $12 million settlement with the SEC and NASD without admitting guilt. In 2006, Zinni argued that more troops were needed in Iraq in the context of preventing the then-budding civil war. In 2007, he worked on a report entitled "National Security and the Threat of Climate Change" with 11 other retired military commanders. The report stated that global warming would act as a threat multiplier to global conflict. General Zinni is also a "Distinguished Military Fellow" for the Center for Defense Information, a part of the World Security Institute. In 2009, Zinni reported that he had been offered and accepted the post of United States Ambassador to Iraq for the Barack Obama administration, but that the appointment had been subsequently withdrawn without explanation. The administration's final choice for the ambassadorship was Christopher R. Hill. On June 26, 2009, General Anthony (Tony) Zinni (USMC ret. ), then a member of the BAE Systems, Inc. Board, has been appointed Chairman of the BAE Systems, Inc. Board and, pending appointment of a permanent successor to Walt Havenstein, Acting President and CEO of BAE Systems, Inc. Tony will also join the BAE Systems Executive Committee in his capacity as Acting President and CEO of BAE Systems, Inc.
General Zinni also serves or has served on the board of Kaseman which has teamed up with Blackwater to pursue security work for the State Department. Since 2011, Anthony Zinni is a member of the board of the Peace Research Endowment. An effort to get him to run for the U.S. Senate has stalled indefinitely, Zinni having said he will never run for office. He says his decision to endorse President George W. Bush in 2000 was a mistake, and in 2003, indicated that he plans to avoid politics in the future. However, on March 3, 2006, Zinni joined fellow former United States Marines General Joseph P. Hoar, Lt. General Greg Newbold, Lt. General Frank Petersen, and Congressman Jack Murtha in endorsing fellow former U.S. Marine and Secretary of the Navy Jim Webb for U.S. Senate in Virginia. Zinni had been floated as a possible Vice Presidential running mate of Barack Obama, the 2008 Presidential nominee of the Democratic Party. In addition to his U.S. military decorations, Zinni holds decorations from France, Italy, Bahrain, Egypt, Yemen, Vietnam, and Kuwait. His civilian awards include the Papal Gold Cross of Honor, the Union League's Abraham Lincoln Award, the Italic Studies Institute's Global Peace Award, the Distinguished Sea Service Award from the Naval Order of the United States, the Eisenhower Distinguished Service Award from the Veterans of Foreign Wars, The Chapman Award from the Marine Corps University Foundation, the Penn Club Award, the St. Thomas of Villanova Alumni Medal, the George P. Shultz Award for Public Service from the U.S. Department of State, and UNICO National's Grand Patriot Award. 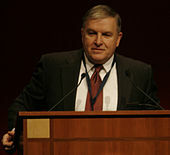 Gen. Tony Zinni (ret.) and Tony Koltz (August 2009). Leading the Charge: Leadership Lessons from the Battlefield to the Boardroom. Palgrave Macmillan. ISBN 0-230-61265-2. Gen. Tony Zinni (ret.) and Tony Koltz (foreword by Tom Clancy) (April 2006). The Battle for Peace: A Frontline Vision of America's Power and Purpose. Palgrave Macmillan. ISBN 1-4039-7174-9. Tom Clancy, Gen. Tony Zinni (ret.) and Tony Koltz (2004). Battle Ready. Grosset & Dunlap. ISBN 0-399-15176-1. ^ "M.I.C. Industries, Inc. is the sole manufacturer of the Ultimate Building Machine (UBM)". micindustries.com. ^ Moroney, Sean (October 11, 2007). "General will teach at Sanford". The Chronicle. Duke University. Archived from the original on April 18, 2011. ^ Who's Who in the South and Southwest, 2001–2002. Marquis Who's Who. 2001-11-01. ISBN 978-0837908328. Retrieved 2013-09-19 – via books.google.com. ^ Newsmakers – Laura Avery. 2003. ISBN 978-0787663919. Retrieved 2013-09-19 – via Books.google.com. ^ "Who will be Obama's running mate?". CNN. June 4, 2008. ^ Dana Priest, 'The Mission,' 2003, pp.180-181. ^ "Statement of General Anthony C. Zinni – Commander in Chief US Central Command before the U.S. Senate Committee on the Armed Services" (PDF). Armed Services Committee, U.S. Senate. February 29, 2000. Archived from the original (PDF) on 26 December 2007. Retrieved 2007-12-17. ^ Karam, Joyce (August 2, 2017). "US dispatching retired general to work on Qatar dispute". The National. Retrieved January 8, 2019. ^ "National Constitution Center, Board of Trustees". National Constitution Center Web Site. National Constitution Center. 2010-07-26. Archived from the original on 2010-07-27. Retrieved 2010-07-27. ^ Board of Governors, Middle East Institute, Retrieved on June 25, 2014. ^ Anthony C. Zinni, Middle East Institute, Retrieved on June 25, 2014. ^ "Wine Country Marines – Board of Directors". winecountrymarines.org. ^ Henrique, Diana (June 20, 2004). "Basic Training Doesn't Guard Against Insurance Pitch to G.I.'s". The New York Times. Retrieved 2007-04-16. ^ Smith, Lamar (September 9, 2004). "Written Statement of Lamar Smith Chairman and Chief Executive Officer of First Command Financial planning Inc on GI Finances: Protecting those who Protect Us before the Subcommittee on Capital Markets, Insurance and Government Sponsored Enterprises of the Committee on Financial Services" (PDF). U.S. House of Representatives. p. 4. Archived (PDF) from the original on 26 April 2007. Retrieved 2007-04-14. ^ a b United States of America Before the Securities and Exchange Commission (December 15, 2004). "Order Instituting Administrative and Cease-and-Disist Proceedings, Making Findings, and Imposing Remedial Sanctions and a Cease-and-Disist Order Pursuant to Section 8A of the Securities Act of 1933 and Section 15(b) of the Securities Exchange Act of 1934" (Securities Act of 1933 Release No. 8513, Securities Exchange Act of 1934 Release No. 50859). Securities and Exchange Commission. Retrieved 19 April 2015. ^ Gordon, Michael R. (November 15, 2006). "Get Out of Iraq Now? Not So Fast, Experts Say". The New York Times. Archived from the original on November 14, 2012. Retrieved 2007-12-17. ^ Slavin, Barbara (2009-02-04). "Obama backs out on Iraq appointment". Washington Times. Archived from the original on 6 February 2009. Retrieved 2009-02-05. ^ "Blackwater firm partners with State Dept., CIA insiders". Spy Talk. The Washington Post. January 10, 2010. ^ "Draft Zinni – It's Security Stupid". Archived from the original on 18 December 2007. Retrieved 2007-12-17. ^ Ricks, Thomas (December 23, 2003). "For Vietnam Vet Anthony Zinni, Another War on Shaky Territory". Washington Post. Retrieved 2007-12-17. ^ "Generals endorse Webb". www.webbforsenate.com. Archived from the original on March 11, 2007. Retrieved 2007-12-17. ^ Wilson, Reid (2007-08-14). "'08 Notes: Vice Squad". Real Clear Politics. Time Inc. Archived from the original on 28 December 2007. Retrieved 2007-12-17. ^ "Gen Anthony C. Zinni". Mcu.usmc.mil. 1943-09-17. Retrieved 2013-09-19. ^ "2001 General Zinni". Nimitz.berkeley.edu. Archived from the original on 2010-06-29. Retrieved 2013-09-19. ^ "Pritzker Military Presents: General Tony Zinni – Pritzker Military Museum & Library". pritzkermilitary.org. Chicago. Zinni's Statement Before U.S. Senate Committee on the Armed Forces February 29, 2000. Wikimedia Commons has media related to Anthony Zinni. "Anthony Zinni collected news and commentary". The New York Times. This page was last edited on 26 February 2019, at 11:55 (UTC).